• Its lateral force-resisting systems (moment frames or frames with bracings, walls, etc.) should continue from the foundation to the top of the (relevant part of the) building. 8 The storey mass and stiffness should be constant or decrease gradually and smoothly to the top. 8 In frame buildings, there should be no abrupt variations of the overstrength of the individual storeys (including the contribution of masonry infills to storey shear strength) relative to the design storey shear. The storey shear force capacity can be computed as the sum over all vertical elements of the ratio of moment capacity at the storey bottom to the corresponding shear span (half of clear storey height in columns, or half of distance from the storey bottom to the top of the building in walls), plus the sum of shear strengths of infill walls (roughly equal to the minimum horizontal section area of the wall panel times the shear strength of bed joints). • Individual setbacks of each side of the building should not exceed 10% of the parallel dimension of the underlying storey. 8 The total setback of each side at the top with respect to the base, if not provided symmetrically on both sides of the building, should not exceed 30% of the parallel dimension at the base of the building. be implemented, a structural model of a fictitious building without the base enlargement needs to be constructed and analysed, to compute its seismic shears within that part of the height corresponding to the enlargement and make sure that the corresponding part of the real building is not designed for less than 75% of these shears. Nonetheless, it serves the intended purpose to estimate these shears assuming that the fictitious building has similar dynamic characteristics to the real one and that a roughly linear first mode controls storey shears. Then, the storey shear that should be exceeded within the vertical continuation of the upper part of the building to the ground can be taken equal to the (base) shear of this upper part just above the base enlargement multiplied by 0.75[1 - (hn + 1/H)2]/[l - (,hJH)2], where i indexes the floor level starting at the bottom, n > i corresponds to the floor at the enlargement and n to that immediately above, hi denotes the floor elevation from the ground and H is the total height of the building. 4.3.3.2.1(2), method is not considered applicable to buildings which are not characterized as structurally 4.3.3.3.1(1) regular in elevation. 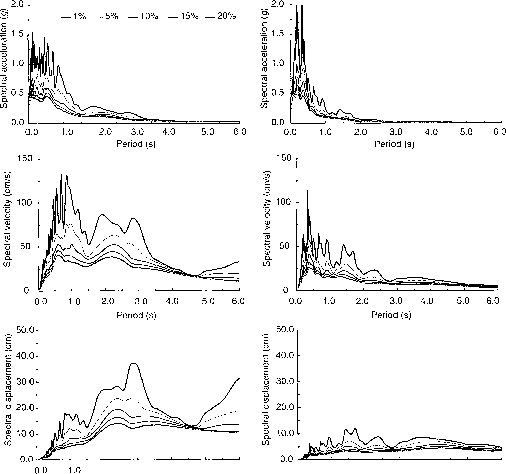 The modal response spectrum method has been found capable of capturing well the effects of structural non-regularity in elevation, not only in the linear elastic response, but, to a large extent, in the non-linear response as well. So its application is mandatory within the framework of force-based design of structures with non-regularity in elevation. This should not be considered as a penalty for such structures: a modal response spectrum analysis does not produce overall more conservative results than the lateral force method. It is simply an attempt to better approximate the peak dynamic response at the level of member internal forces and deformations. • capacity design of all members in a steel or composite frame with bracings that are not intended for energy dissipation, so that they remain elastic, etc., may be in doubt. It is likely that there will be a local concentration of inelasticity at the elevation(s) where the irregularity takes place (e.g. at a large setback, or where a lateral force-resisting system is vertically discontinued, or where a storey has mass, lateral stiffness or overstrength higher than in the storey below) beyond the predictions of the modal response spectrum (elastic) analysis. Such a concentration will increase locally the deformation demands on dissipative regions, above the building-average value corresponding to the value of the q factor used in the design. Instead of imposing more strict detailing on the regions likely to be affected by the structural non-regularity to enhance their ductility capacity so that they meet the locally increased ductility demands, the value of the q factor used in the force-based design is reduced by 20%, without relaxing the detailing requirements anywhere in the structure. The resulting 25% increase in strength demands for the dimensioning is intended to reduce the locally increased ductility demands around the elevation(s) where the irregularity takes place to the level of their ductility capacity. No matter how closely that goal is met, the 25% increase in strength demands for the entire structure is certainly a major disincentive to adopting a structural system that is non-regular in elevation.